Biodiesel is a vegetable oil based fuel that can be safely used in any diesel engine without modification. No "conversion" to the diesel vehicle or engine is necessary. It does not contribute to global warming and offers substantial reductions in emissions over petroleum-based diesel fuel. And, biodiesel contributes to engine life and performance due to its higher lubricity. 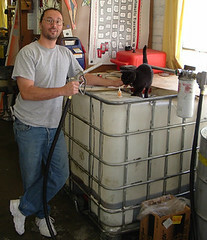 who are able to host a "tote", which is a small tank to store biodiesel at their home or business. These heavy duty plastic totes are available in 275 to 330 gallon sizes which occupy a space about 4 feet by 4 feet square and 4 feet tall. A host site can simply be a residential garage, a shed or an industrial warehouse with vehicle accessibility. Since biodiesel is nontoxic, biodegradable, and not directly flammable, it is completely safe and legal to store in these plastic tote containers above ground with only maintenance considerations for potential leaks or spills. All new tote hosts will be provided with complete guidance for smooth set up and operation through a sample Biodiesel Buyers Co-op Agreement and are free to determine all terms of operation such as designated fill-up times and the number of members to be accommodated. Once set up, they can take advantage of periodic biodiesel group purchasing sessions organized with the other local tote hosts to receive greater quantity price discounts and shipping charge reductions. Totes are generally refueled by a medium size tanker truck by pump and hose without the tote itself needing to be moved. The initial equipment expenses usually include only the cost of the tote, pump and filter. If the host fronts the cost of these initial equipment expenses, they are generally recouped through membership or service fees by agreement with the members, separate from the price of the fuel which is sold at cost. Discounts and purchasing assistance is available for all these initial equipment items regardless of who fronts the cost. The more tote sites we can get running in Sacramento, the more likely we can bring down the price of biodiesel in the area and make it a real alternative to petroleum fuels. So step forward to host a tote, or recommend someone who can! Steve Bash will again bring his Biodiesel Info Booth to the annual Whole Earth Festival in Davis this weekend, May 6-8. He'll be there Friday from 1 p.m. to 6 p.m., Saturday and Sunday from 9 a.m. to 6 p.m. This is the place to ask all your questions about biodiesel and vegetable oil fuels, and how to free yourself from petroleum dependency! Books and videos will be for sale, along with free literature to take home. Samples and demos and friendly conversation will also be presented in abundance so you can see and feel what the biofuel movement is all about! The festival is at the UC Davis Main Quad, with parking available both on campus and in town nearby. Of course, the festival also features food, music and lots of other Earth-friendly displays and entertainment. And admission is totally free! For more info, check out the Whole Earth Festival website.